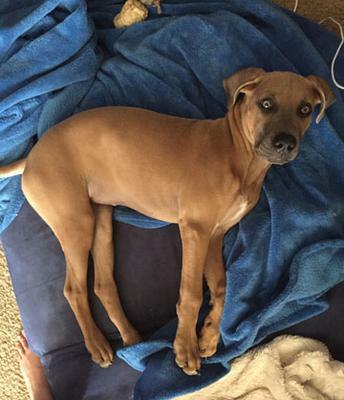 Our puppy, Tina, is half dane, half pit, is a loving cuddly, intelligent puppy. She's actually pretty submissive when she's at home with us. We got her when she was 12 weeks old. She is now 15 weeks. She has learned commands and boundaries with us. She sits, stays, comes, she's learning to lay down. She will "drop it" if she's chewing something she shouldn't. She sits and waits to be fed. She sits before being petted, before entering the house. She's not allowed on furniture (except for a cushion with a back thing that sits on the floor and is "hers", but she tries sometimes. So you may be thinking, what's the problem? The issues are 1.) Leash training- she started off really great on the leash, loosely walking with us. She's since realized she can pull, and I don't know how to train her to walk next to or behind me, or at least loosely. 2.) My 5 year old son and I took her to the lake yesterday and there were two well trained adult dogs off the leash-- they approached her and she clearly wanted to play. With one of them she was gentle, and with the other she still seemed happy and playful, but maybe a little intimidated and started nipping at his face. He was a brute and could have killed her in one bite, so I took her away immediately. How do I deal with this sort of situation? 3.) Similar to when she had different responses to the two dogs, she's that way with guests or strangers... with some, she seems nonchalant, and with others she tries to jump and scratching, mouth opening, in their face, nipping... IT IS CRAZY and embarrassing.. I learned from you that she should be wearing her harness while I am trying to correct behavior, and also that she should not be allowed to roam the house so much. She is crate trained so I'm going to start putting her in there more often. To summarize: Leash, strangers (dogs and people), and nipping... these are our main issues and we don't want them to develop into something uncontrollable, especially b/c she's going to be, already is, quite large.